trash: The Corp discards 2 cards from HQ at random. "Make a run on HQ. If successful, instead of accessing cards, the Corp discards 2 cards at random. If the run is unsuccessful, return this card to your hand." That'd be a great card, right? 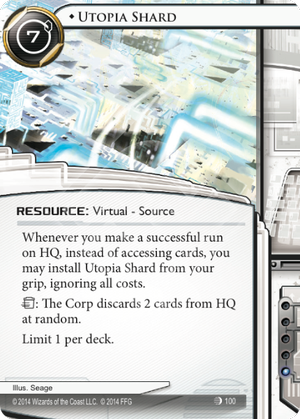 Utopia Shard is that, but so much more flexible. You can make the run, then trigger the effect you want it (like when you see the first card of a Cerebral Imaging combo, or SEA Source / Scorch / Scorch, or are about to hit archives for some other reason). Or you can get the effect WITHOUT EVEN RUNNING ON HQ.